"Is the World T20 on par with the World Cup?". Cricinfo presents two arguments, for and against, and asks the fans to comment. You can give your view right here, but honestly the only argument for ODI cricket that is making sense is that it has some history associated with it. And history means old. In the past. Done and dusted with. The last time I truly enjoyed the World Cup was in 1999. There have been 3 World Cups since then and they have barely been exciting. On the other hand, this is the 4th World T20 in the last 5 years and each edition has been the most entertaining show put on by the ICC ever. Solely my opinion ofcourse. But here are 10 reasons why I think that the World T20 is not at par with the World Cup, it is beyond par and a far better tournament. No seriously!. We all love the cheerleaders. For years and year we wondered why was it that girls danced only for men playing basketball, football, or baseball. What about cricket? Apparently it wasn't exciting enough and no woman wanted to sit around for 8 hours (or 5 days) waiting for a boundary or a wicket to step up and shake a leg. But T20 Cricket provides that opportunity almost every over. And on good days, multiple times during an over! There are no cheerleaders in the World Cup. In the World T20, there are plenty. The World T20 provides a platform for the associate nations to shine. There is no question that the associate nations like Ireland, Afghanistan, Netherlands, Kenya and others are way more competitive in T20 cricket than they are in ODIs. Such is the nature of the game that plenty of fans fancied Afghanistan and Ireland to upset India and Australia respectively during yesterday's matches. Moreover, many believe that Bangladesh can topple New Zealand and Pakistan! No such thought would even be entertained at the World Cup, where the minnows go through bashing after bashing in a series of meaningless matches. There's a case for including more associates in future World T20 tournaments, and a very strong case. Teams like Kenya, Netherlands, Scotland, UAE, USA, Hong Kong can surely be playing this tournament. Number 8: Meaningless ODI Cricket. The ICC restricts the number of T20 internationals that teams can play during a bilateral series and during a year, keeping the total number of T20Is played at a low level as compared to ODIs, which are played in abundance. Meaningless bilateral ODIs have pretty much taken the charm of ODI cricket away. There are so many ODIs played during a year, which have no meaning or purpose, that by the time the World Cup comes around the first thing we wonder is when the first month and a half will end so we can get to the business end of the tournament. T20 cricket is largely played at the league/club/domestic level so the appetite for international T20 remains large. The World T20 lasts for a total of 20 days. 25 if you count the warm ups, which are just as exciting as the actual game. Watch Pakistan vs India from 2009 or from two days ago and there would be nothing about the games that would say "warm up". Plus in those 20-25 days, there is not a single day of meaningless games of cricket. There is no single day on which any one can confidently say that this team is going to win. There is no single day on which we can miss the action because it all counts for something. The World Cup lasts for over 50 days, and 75% of the days are completely meaningless, which hardly have any bearing on the composition of the Super 8s or 6s or quarterfinals. Boring! Number 6: Australia doesn't win the World T20. It is a big reason honestly. The Australians will not like this, but one reason why the 2003 and 2007 World Cups were pointless was because it was quite clear that Australia will win them even before a single ball was delivered! The ICC might as well have given the trophy to Australia without holding the World Cup. What's worse is that the Aussies didn't even try to make it exciting by losing a match or two. They just marched along winning match after match and lifted the trophy in the most robotic manner possible. They need to learn a thing or two from Pakistan! When it comes to the World T20 though, Australia lose in the semis, they exit in the first round, and they make the final in the most exciting manner ever but lose. Now that makes it exciting! Not only are the minnows more competitive, the relatively stronger teams also compete more fiercely in T20 cricket. Its a fire cracker of a game with very little margin of error due to the shortened time. Majority if T20 games provide a clearer indication of the side that will win during the last 4-5 overs. While in ODIs, majority of the game are predictable. With half of them you know the winner before the match even starts, and with the rest you know after the first innings. The intensity among cricketers is at all time highs during T20 games. Even more so during the World T20 games. Not that the intensity is not there during the World Cup, but there are so many games during which the players can switch off. During the World T20, you can't switch off for even a minute! Not many people predicted India to win the World T20 in 2007. Or Pakistan in 2009. Or England in 2010. Nor can many people pick one team that they think will win it this year. That is how open the World T20 typically is. It is really any body's cup. And this year it is being touted as more open than previously. Probably so. How often do you see that happening in the World Cup? Australia. Australia. Australia. India. Well not the 1999 one, but every World Cup since then was pretty much called out and predicted by the majority well before the opening ceremony. Number 3: It is a World Cup Damn it! I'm not too sure why the ICC shies away from calling it the T20 World Cup, because it is a damn World Cup. Its not the ODI one, sure. But it is a T20 World Cup where all the cricket nations are competing for T20 supremacy. 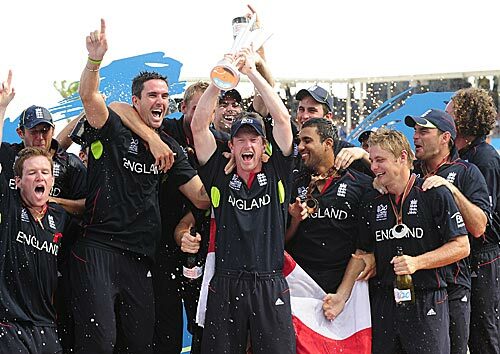 Are England not the T20 defending champions? Are India and Pakistan not the former T20 champions? You only become a champion if you win a World Cup. So sure the World T20 sounds good as a brand and has a good ring to it, but it really is the World Cup. That really nullifies the question! So the biggest argument that the World Cup has going in its favor is that it has history associated with it. Almost 40 years of it. That's a long time compared to the 5 years of history that the World T20 has, but so what really? History will be made. And a lot of it has already been made. India will always be remembered as the first ever T20 champions. Misbah will always be remembered for playing that ill-fated scoop in the epic India vs Pakistan final in the first World T20. Shahid Afridi will be remembered for championing a successful 2009 campaign for Pakistan. And the World T20 2010 will go down in history as the first ever major tournament won by England, the inventors of the game. So what history is the World Cup boasting about? Sure there's a lot, but doesn't mean that the World T20 doesn't have one. Number 1: The Global Footprint. If cricket is to expand into new global markets, then T20 cricket is the way to do it, and the World T20 is the platform to showcase the new countries on. The largest World Cricket event that has taken place thus far is a 16 team World Cup and it was full off meaningless one-sided ODIs that hardly anyone paid interest. A World T20 with 16 teams, or even 20 for that matter, can be an exciting event. I reckon that 10-15 year down the line the World T20 can even be a 32 team event ala FIFA World Cup. That is when one will be able to say that cricket has finally established its global footprint. With a 120+ years history, it is about time it does! T20 Cricket is the way to go and the World T20 is the platform to promote it to the world. At par with the World Cup? Way beyond! On the other hand the ODI world cup, I have followed each and every one since 83 with all my passion. Its not important that matches be close or 'exciting'. Its a question of prestige. I actually disagreed to that on Cricinfo. I do agree with some of your points, but 40 years of WC and 5 years of World T20 is incomparable. Some old folks (of course, the ones who grew up watching Test cricket) still think T20 is a joke and gully cricket. Think, when India were knocked out in the group stages in the 2010 World T20, no one really cared. But suppose the same had happened in the 2011 ODI WC? Even if they lost the final, there would have been a huge uproar causing great violence. So the WC and World T20 (yes, it is still the world T20) are currently on different planes. But chances of the World T20 surviving more than 10 years look bleak to me, looking at those sparse crowds in Sri Lanka, it looks as if no one cares! Great post by the way! Friday, January 23, 2015 This comment has been removed by the author.